Facebook Introducing Archiving of Campaigns, Ad Sets, Ads Sept. 19? 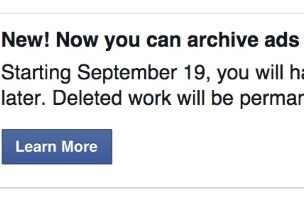 Some Facebook page administrators are seeing alerts in Ads Manager informing them that they will be able to archive campaigns, ad sets and ads, starting Sept. 19. Starting Sept. 19, you will have the option to archive campaigns, ad sets and ads. Your archived work can be viewed later. Deleted work will be permanently removed. Your archived work will still be viewable in Ads Manager, and you’ll continue to be able to view the stats associated with archived objects. Archived objects are read-only. You can only view their reporting stats, but cannot make any changes to them or activate them again. You can have a maximum of 1,000 archived campaigns, 1,000 ad sets and 5,000 ads at a time across the whole account, and we’ll let you know when you get close to the limit. If you reach this maximum, you’ll need to delete a few archived objects to make room for new ones. Deleting an archived campaign, ad set or ad removes it from Ads Manager permanently and is permanent. Best practice: Delete archived ads 28 days after their last date of delivery to ensure stats will no longer change. Note that if you delete an archived ad, it may still track impressions, clicks, and actions for 28 days after the date of last delivery. For example, if you have an ad set with two ads within it and delete one, the stats for the ad set will include stats for both ads, but you won’t be able to access the one you’ve deleted. Page admins: Are you excited about this new feature?